MANOA BUNGALOW. Done in the style of the "arts and crafts" movement, this bungalow draws inspiration from homes in the Manoa valley built in the 1920's. As with most of our designs, the style is a blend of contemporary and traditional. The feeling of nostalgia and warmth is, however, unmistakable. This cozy cottage is under 2000 square feet but features large rooms and ample storage. Sliding partition doors allow for spaces to be open and flowing or private, depending on the changing needs of the owner. The style combines touches of old England and the Orient. The roof system allows for high ceilings and is visually poetic in its graceful transitions. VIENNA HAUS. Inspired by the turn-of-the century homes of Austria, this charming house also reflects the fascination of that era with things oriental. 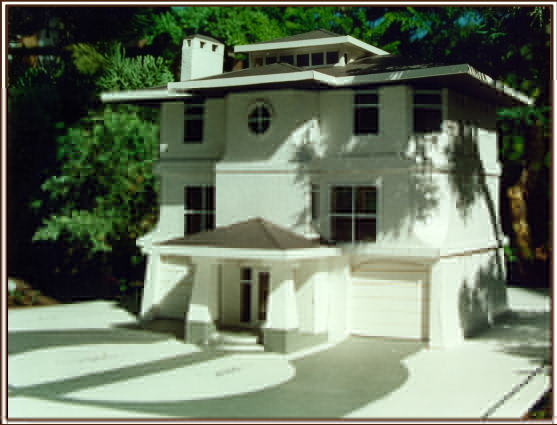 This unique three story home features a garage on the first level plus a media room or separate living studio.